In this free to play MMO players are the rulers of their very own medieval Empire, responsible for paving the way for expansion by establishing their city, raising defenses, then forming an army to protect it and aggressively expand by attacking rival settlements and cities. Game of Emperors offers traditional empire building strategy gameplay where players must manage resources and compete against each other in PVP for ranks and prizes; the game can be played directly through the official website and doesn't need a client download. The core of the game is for players to create and run an efficient empire tasked with managing their time to priorities builds and tasks that suit their playstyle and end-game plans, as well as acquiring, using and replenishing various types of resources. 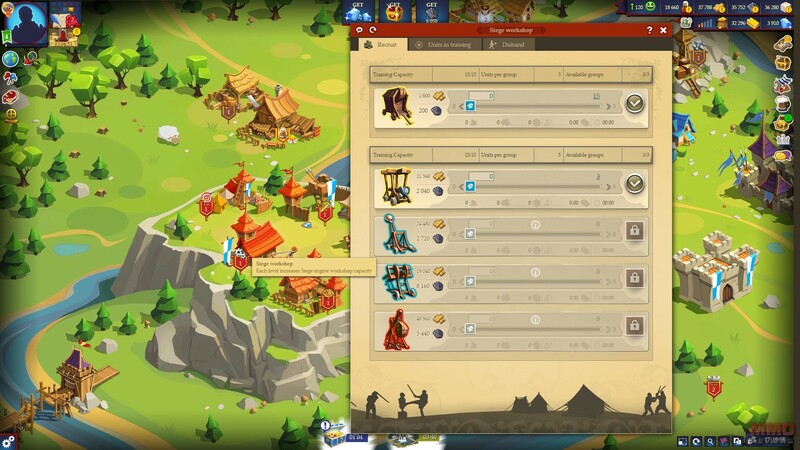 As the game progresses players will find longer queue times for construction, research and training, as well as maneuvering units across the world map, however, tasks such as these continue even when the players is offline and so shorter sessions where players log on, manage their Empire to select their tasks, and then log off again are perfectly viable. The game is free to play with a premium "Diamond" currency that can be purchased with cash or earned in small part through some gameplay elements; Diamonds allow players to rush various tasks, replenish missing resources, and purchase VIP that grants a variety of bonuses. Combat really is the name of the game, after a player’s "New Player Protection" wears out that ensures they cannot be attacked by other players, then they become a potential target. Upgrading city fortifications and defensive military units is only one step; sometimes aggression is the best defense and players will have to strike first as they take out rivals before they get too strong. With a wide selection of available units players must make a balanced army to cover any potential weaknesses as different units are strong or vulnerable against each other, e.g. Cavalry are strong against swordsmen but weak against spearmen, spearmen are weak against swordsmen but strong against cavalry and, whereas Archers are strong at ranged but quickly destroyed if units reach melee distance. To ensure players do not send the wrong troops into battle then they can use Spies to gather important intelligence on an opponent's forces and then strategize which units are the best to send into combat. The combat itself is completely automated and players will find the results of the battle through an automatic Battle Report after every encounter, showing the victor, the spoils of war, and the casualties from the fight.